One elegant soul perfect for working in tight spaces that require precision and accuracy; and another sporty and rock’n’roll soul for creating a great feeling with the operator on site and in all weather conditions. All this thanks to the innovative control software. Cranes also have a soul. In fact, they can sometimes have two: an elegant and symphonic one and a sporty and rock’n’roll one. 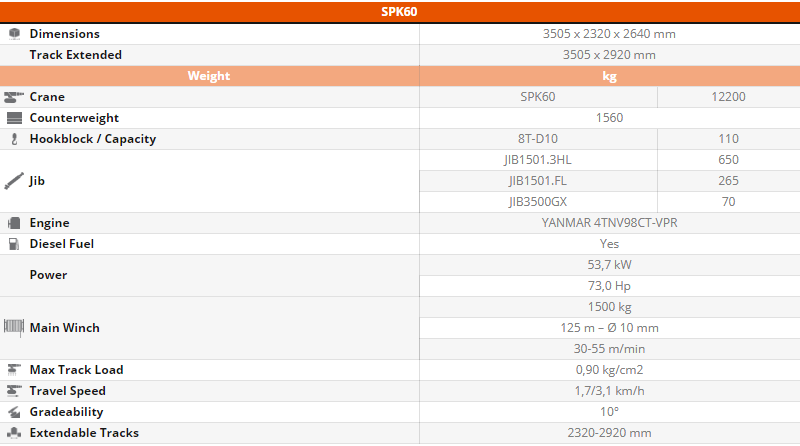 Jekko has a crane with two souls and it’s called SPK60: the only one of its kind on the world market. 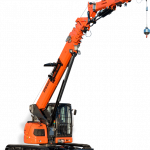 The SPK60 was born in 2016 as a telescopic boom crawler crane with cab to be used mainly in confined and difficult spaces where millimetre-level precision and controlled movements are required. This formula was a success and gave the market something it was missing. After two years of experience on the field, our designers have made further improvements and enhancements to this winning project. The challenge? To give the SPK60 a sportier identity aimed at guaranteeing extraordinary performances and a great feeling with the operator, even in the harshest and most challenging weather and ground conditions. This led to the birth of the new SPK60, a 2.0 version of the previous one, which has two identities for every operating requirement: from precision manoeuvres in tight and enclosed spaces, to pick&carry operations on rough terrain and in the rain. All this thanks to the new version of the machine’s management software that gives the SPK60 a brand-new identity, or rather two identities. 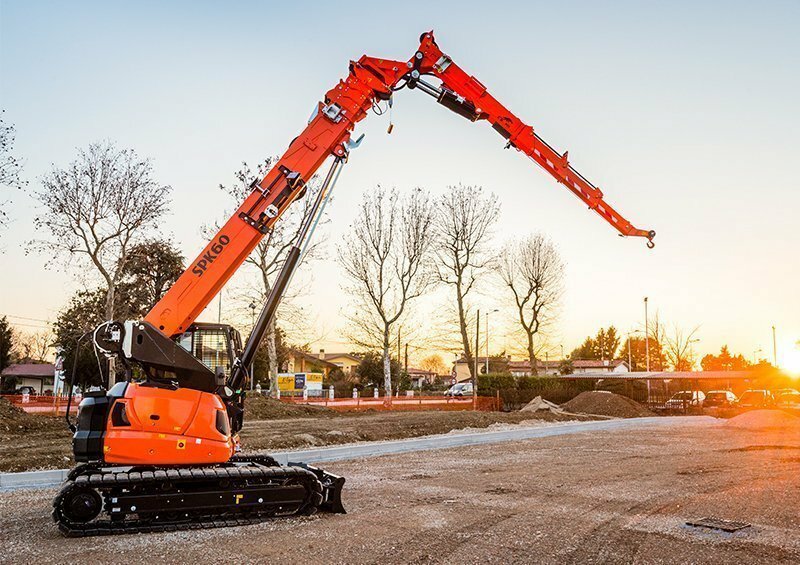 The “sporty and rock’n’roll” soul is expressed by a crawler picker and an excavator with a boom that can work in any construction site, on any type of terrain and inclination (up to 4 different degrees 0°, 0.7°, 1.5° and 3°). 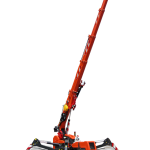 This mini-crane is equipped with extendible tracks without stabilisers, capable of lifting up to 3 tonnes in Pick&Carry mode and 6 tonnes in static mode and can reach a maximum height of 26.7 metres with jib. All this is made possible by the new innovative software that creates a great feeling with the operator for maximum stability. This stability is necessary as the crane rests on a maximum radius of 2.9 metres by 2.5 metres. The software allows electronically controlling the machine directly from the radio remote control unit provided, adapting itself to any operating situation and environment. 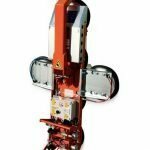 This new version of the SPK60 is suitable for sectors such as construction sites, installation of metal structures and platforms and industrial maintenance, because the crane is equipped with a hydraulic manipulator for pipes and beams that guarantees extreme precision when handling and lifting materials at a height. It is also perfect for the installation of glass panes, especially in urban areas where small dimensions and high performances are required (the SPK60 can install glass panels on facades up to a height of nine floors). The mini-crane is extremely easy to transport and is only 5.8 metres long which makes it easy to unload from the body of a truck. When needed, the new SPK60 can take off its leather jacket and jeans and put on a jacket and tie. Just ask the new control system. This is when the elegant soul appears, consisting of a telescopic crawler crane with cab and hydraulic jib – the longest in its category – extendible tracks and electric motor for working easily and smoothly in confined spaces. This type of machine can be used in a variety of different applications. In fact, it is suitable for the petrochemical industry, maintenance of nuclear/electric power stations, industrial maintenance and for all indoor, confined and tight spaces where stabilisers cannot be used, and also inside buildings where significant extensions are required. In fact, the hydraulic jib of this mini-crane can extend past the main boom by an additional 8.2 metres for a maximum height of almost 27 metres. The radio control unit allows it to be used like a classic mini-crane and to have all the working data displayed. In fact, the operator must always be close to the load to be lifted, thus increasing the precision of the work, reducing risks of communication between the installer and driver, and consequently reducing the presence of operators on site. The SPK60 also embraces the Jekko philosophy: One crane = One operator. Each operator can assemble and disassemble the crane components and accessories on their own. But the most important advantage is the automatic “table change” lifting system based on the slope of the ground. The crane automatically activates the relative table according to the slope of the ground in order to guarantee fluidity of the work, maximum safety and reduction in the time needed to manually confirm the new setting to the limiter, like most cranes available on the market. Under the main boom so that customers who frequently use the jib do not have to install it every time. On the right side of the crane boom so that the jib is always on board the machine, ready for use. Ideal for customers who often use the main boom of the crane in pick&carry mode or at its maximum capacity. The machine weights are low: 12.2 tonnes, plus 1500 kg for the removable ballast. The SPK60 has a Yanmar 53.7 kW/73 Hp diesel engine and, if necessary, can alternate with a three-phase (or single-phase) 11kW electric engine. Depending on the situation and requirements, the operator can easily switch from one solution to the other with extreme flexibility, both indoors and outdoors. This allows the crane to be used in many different situations and contexts, exploiting its two souls. For example, it can be used in interior spaces by taking advantage of jibs and radio remote control or by changing the software, and can also be used as a crane in large construction sites, with operator in the cab, keeping the tracks extendible and thus increasing the lifting capacity compared to similar machines. The cabin is extremely ergonomic and comes with a video camera for perfect rear vision, as well as a radio, air conditioning and ergonomic seat with wide visibility. It is not only comfortable, but also easy to use because the graphic display allows immediately recognising the accessories installed on the machine, thus allowing the automatic setting of the machine’s moment indicator. The software comes with a self-diagnosis system (DTC) for detecting any problems immediately and guaranteeing quick feedback from the Jekko after-sales service. Hydraulic jib with 3 hydraulic extensions and a width of 8.27 metres and maximum capacity of 1500 kg. Possibility to work at a negative angle of 10 degrees, with both winch and hook. Short mechanical jib of 3500 kg on the main boom to work with both hook and winch. 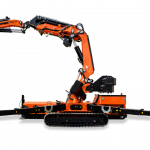 Radio-controlled hydraulic manipulator for moving pipes or beams.